Durability – steel buildings are built to last decades longer than traditional materials such as wood or brick. 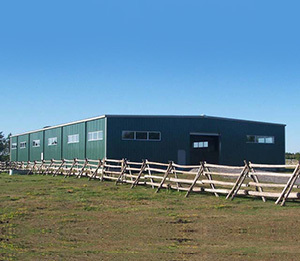 Flexibility – with a variety of sizes and features available, they can be used to house one or multiple horses, and even to store feed and other related items. Customizability – steel building offer easily addable custom features for very little cost. If you are in the process of planning a horse shelter, steel may be exactly what you’re looking for. Here’s how to build a horse shelter using a prefabricated steel building. When planning for your shelter, you need to locate an area that is flat and not at risk of flooding or standing water. You want to ensure that the area is big enough for the size of structure you plan to build (the size will be a result of what exactly you need from your building, how many animals you have, etc.). Once you have figured out the size and the location of your horse shelter, pour a floating concrete perimeter footing on which the steel structure will rest. Steel buildings come with a number of easily assembled, pre- drilled panels. Assemble these on the ground with a flat overlap, thus ensuring a watertight seal. The next step to build your horse shelter is to raise the panels that you have fastened together. Because the panels come in an arch shape, they require very little force to be raised, meaning there is no need for heavy duty equipment. Secure the panels to the foundation. Once the main body of your horse shelter has been built, the next step is to add the finishing touches. Insert end walls and any doors or other parts, and tighten all necessary bolts. Just like that, you have a brand new horse shelter ready to go! Having trouble determining how to build a horse shelter? Why not make it easy for yourself by opting for a steel building? Call Toro Steel today at 1-877-870-8676 to learn more!